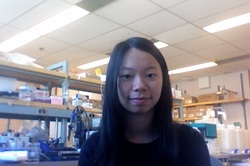 Research Summary: Sunny first began volunteering in the Rossi Lab in the summer of her grade ten year, and is thoroughly enjoying this unique learning experience. She is currently working with Dario on the activity of macrophages and fibro-adipogenic progenitors (FAPs) during skeletal muscle regeneration. Personal Summary: Sunny is an avid participant in both Point Grey’s symphonic band and badminton team. In her free time, she also enjoys reading and story-writing.